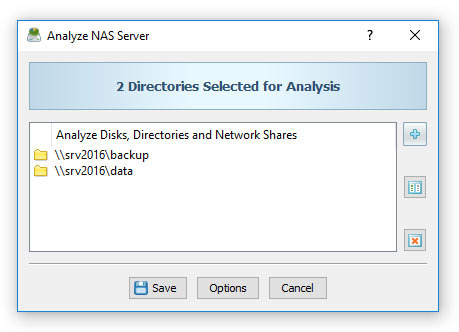 DiskSavvy Server allows one to configure multiple disk space analysis commands with each one capable of processing a number of disks, directories or network shares. In order to add a new disk space analysis command, press the 'Add Command' button located on the DiskSavvy Server home page, specify a unique command name, enter one or more disks, directories or network shares to analyze and press the 'Save' button. In addition, the user is provided with the ability to exclude one or more directories from the disk space analysis process, add one or more file matching rules specifying which types of files to analyze and/or add one or more disk space analysis actions capable of sending E-Mail notifications or automatically generating reports when one or more directories are matching user-specified rules and conditions. 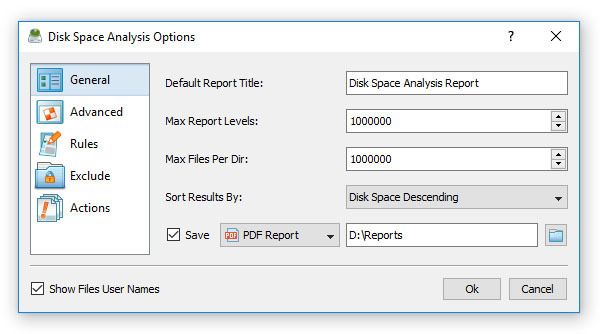 Finally, users are provided with numerous advanced disk space analysis options allowing one to set a custom report title, configure how many history reports to keep for each disk space analysis command, select a disk space analysis performance and directory scanning modes and/or automatically generate HTML, PDF, XML, Excel CSV or text disk space analysis reports in a user-specified directory.